An internal affairs investigation into two Salt Lake City police officers involved in the arrest of a University Hospital nurse has found several department policies were violated during the July 26 confrontation. Salt Lake City Mayor Jackie Biskupski announced the investigation findings Wednesday in a news conference at City Hall. In addition, she discussed a recently-completed review by the city’s independent Police Civilian Review Board, which also found the officers violated department policies. Detective Jeff Payne and his watch commander, Lt. James Tracy, now have 20 days to respond to the internal affairs investigation, after which Chief Mike Brown will use the reports to make a decision on the officers’ future. Tracy and Payne could face consequences as severe as termination by the department. A criminal investigation into the incident also continues, involving the Unified Police Department, the FBI and the Salt Lake County District Attorney’s Office. Payne arrested nurse Alex Wubbels — leaving her in his hot patrol car for about 20 minutes — after she refused to allow him to obtain a blood sample from an unconscious patient injured in a fiery crash in Cache County, citing hospital policy. Tracy was Payne’s supervisor the night of July 26 and responded to the hospital when Payne encountered challenges obtaining the blood. The department placed them on administrative leave Sept. 1, a day after Wubbels’ attorney released police body camera footage of the arrest. Full internal affairs reports on Payne and Tracy, obtained by The Salt Lake Tribune through a public records request, found both officers violated five policies: conduct unbecoming of an officer; courtesy in public contacts; a policy that states misdemeanor citations should be used instead of arrest ”whenever possible”; violation of the department’s law enforcement code of ethics; and a city-mandated standards of conduct policy. Investigators additionally found Payne violated a policy requiring officers to file a ”use of force” report after someone is physically detained. Investigators wrote Payne’s conduct was ”inappropriate, unreasonable, unwarranted, discourteous, disrespectful, and has brought significant disrepute on both you as a Police Officer and on the Department as a whole. “You demonstrated extremely poor professional judgment (especially for an officer with 27 years of experience), which calls into question your ability to effectively serve the public and the Department in a manner that inspires the requisite trust, respect, and confidence,” the report adds. 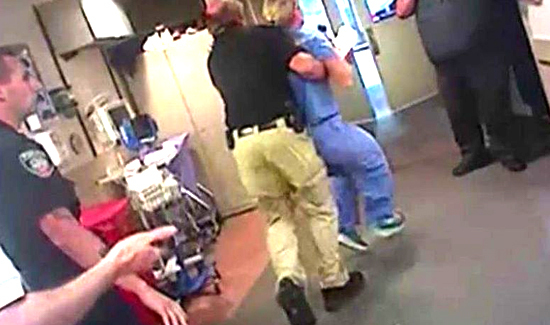 The nurse purposely stood in the way of a legal investigation. All the “violations” seem to be PR.